The Region has long been known for its beaches, leisure and entertainment offering discos, theme parks and restaurants that make this area one of the most beloved by tourists from all over Europe. In addition to its summer face and purely, Romagna offers much more: villages and medieval fortresses, towns set among the green hills, castles belonging to noble families vanished. Some locations are particularly interesting and suitable for a day trip in the inland. Santarcangelo di Romagna Is about 20-minute drive from Rimini and offers a pleasant walk to its visitors, the streets are cobbled climb leads to the bell tower that dominates the entire city. 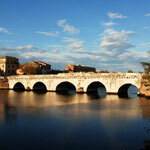 Inns and restaurants are the perfect place for a tasting of typical products of Romagna. 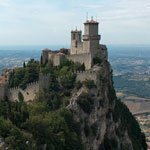 The Republic of San Marino It is located just 20 kilometres from Rimini, is situated on Mount Titano and offers from Piazza della Libertà a landscape that dominates the Romagna and takes your breath away. A walk in the old town will prove enjoyable and interesting. Gradara Outside the borders of Emilia Romagna and Marche territory, Gradara is little more than 27 chilomeri da Rimini. The Castle, the walls, the stone streets make this one of the most charming place to visit and one of the most charming, the rest are just these stones that still guard the secrets of troubled love between Paolo and Francesca. San Leo To get to the Fort of San Leo it takes about 40 minutes by car, and once you arrive you can breathe the atmosphere of a time now past. The spur of rock on which lies the Fort is proud and majestic and still hides the mysterious story of Cagliostro Italian alchemist who was taken prisoner.